An artist who left 1,000 paintings on the streets of London for people to pick up has given his seal of approval to those already selling them on eBay. 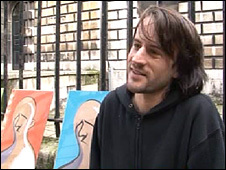 A team of helpers left Adam Neate's works around the capital on Friday night and within hours they were appearing for sale on the website. Neate said: "Humans are humans and everybody likes to make money. "I have not got anything against people putting them on eBay - and if it helps them with Christmas..."
Some pictures have been put up for sale for bids over £1,000, while others started at a more modest 99p. Neate's work has previously fetched up to £43,000 at auction. The run of 1,000 pictures, with each piece featuring a different combination of printing and stamping, were distributed across all 32 London boroughs and the City of London. Neate said: "I like the idea you can stumble across art in any environment, not just a gallery - you can walk along the street and find a painting."